The 1994 Drum Corps International World Championships were held at Foxboro Stadium in Massachusetts, home to the NFL's New England Patriots and now the site of a parking lot for the much larger Gillette Stadium. 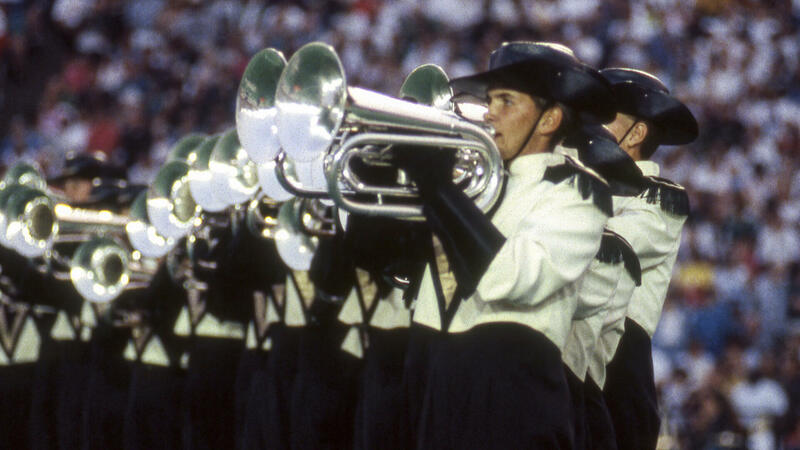 Notable to 1994, was that it marked the very first year that none of the marching members¬by age eligibility ruleshad been born yet when DCI held its first Championship in 1972. Magic of Orlando became a finalist for the first time and after the big show, DCI Hall of Fame member Don Pesceone retired after leading DCI as its executive director for more than two decades. Also this summer, Blue Devils accomplished DCI's second-ever undefeated season, the first since the California corps went unbeatable in 1982. Among the most photographed moments of the year were the Cadets forming both a shark and a jet during the finale of their “West Side Story” show, Santa Clara Vanguard's Cossack dancers disappearing amidst a blur of flags, and Crossmen's members laying down on the field to spell, “Children are the future,” with their bodies. In the corps' second year as a World Class (then called Division I) finalist, Glassmen finished in 10th place with “Days of Future Passed,” a show named after the Moody Blues studio album of the same name, released in 1967. The English rock back was formed in 1964 and at first was known for playing rhythm and blues. “Days of Future Passed” is regarded as one of the first successful “concept albums,” a term given to rock albums with an overall story arc that is based on a single theme or thematic concept. The album is also regarded as both one of the first and most successful progressive rock efforts and is also the first full album to meld a rock band with a symphony orchestra. Glassmen's production started with the “tic-tock” sound of an old-style clock, during which drummers in a circle hoisted large red spheres as a visual element. The spheres were tossed to members of the color guard as the chimes of a grandfather clock were heard from the front ensemble, followed by the scraping mechanical sounds of the clock being manually wound. The moment culminated with the famed chime motif of the Palace of Westminster's Big Ben landmark in London. Next was “Another Morning,” written by Ray Thomas, the band's lead singer who also played flute, harmonica, and occasionally percussion. This spry and spirited work, referred to as a European style dance song, looked to the unveiling of the day with optimism and anticipation. On the field, the work segued into a standstill fanfare rendition of “Dawn Is a Feeling,” written by keyboardist Mike Pinder. The piece then returned to the introduction of “Another Morning” and “Peak Hour.” This segment of the show included a brief percussion interlude and "Tuesday Afternoon," written by keyboardist Justin Hayward. The song, capturing the chaotic nature of a busy and somewhat frantic workday, was the other song besides “Nights in White Satin” that eventually made the hit parade. Color guard members returned to the giant red spheres for a drum feature taken from the second half of “Peak Hour.” It showcased large ethnic Latin drums that the corps would be known to utilize in multiple seasons. More “tic-tocks” led into a reprise of “Tuesday Afternoon,” but this time performed more in the style of the Moody Blues album, as opposed to the fanfare rendition heard earlier in the show. Some members of the horn line danced a very short jig during the work's interlude, which eventually led into another fanfare. Next the corps featured “Nights in White Satin,” which was by far the most famous hit from the “Days of Future Past” album. Hayward stated he got the idea for the song after someone gave him a set of white satin bed sheets. In the 1960s, it was difficult to get long-playing songs performed on the radio, but that changed after the Beatles' “Hey Jude” (1968) and Eric Clapton's “Layla” (1970) demonstrated listeners would stay tuned for a longer song they liked. Because of this, it would be somewhat obscure until its re-release five years after the album debuted. Glassmen used the tune to finish the show, but instead of fading out into oblivion as the rendition in the album did, the corps utilized another brief “tic-tock” sound that seemed to lead into the raucous noise of an alarm clock going off, letting us know the night was over and a new day was to begin. 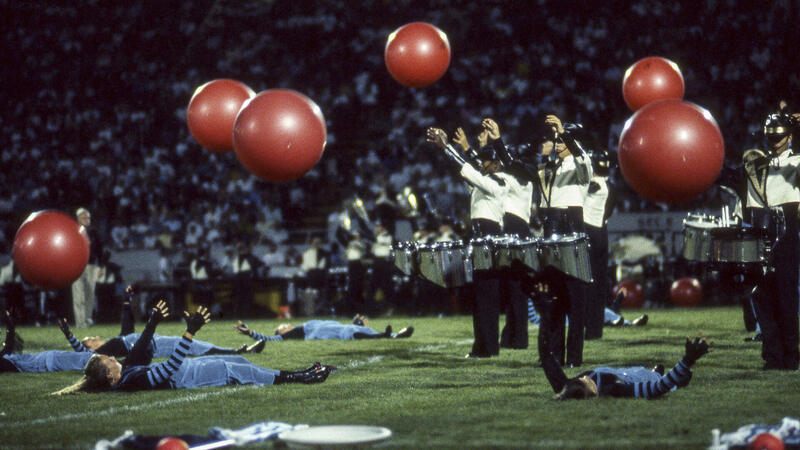 This was further emphasized by the color guard members swinging smaller yellow balls attached to ropes, with the entire show ending with a large yellow sphere rolling down the legs of two color guard members to represent the sun.